History of the Vine Inn on Villa Street in Hockley in Birmingham in the county of Warwickshire. 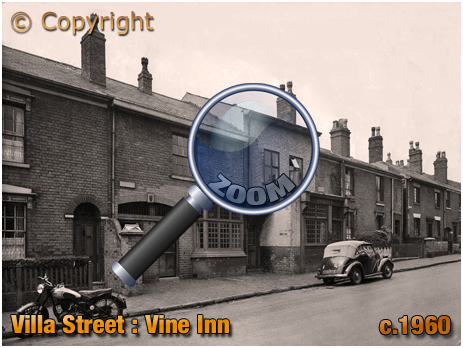 The Vine Inn Arms was located on the western side of Villa Street midway between the Crown Inn and Villa Tavern. The address of the pub was No.127 Villa Street but this was after re-numbering of the thoroughfare in the late 19th century. The pub, formerly listed at No.71 Villa Street, was extended into the neighbouring property to the left in this photograph below. This extension work took place shortly after September 1911 when permission for the work was granted during Aston's last licensing sessions. With many thanks to Lyn Harrington, I can display this photograph of the Vine Inn. Lyn used to live across the road from the pub and has many happy memories of the place. The original beer house is to the right-hand side behind the convertible automobile. The building is taller than the neighbouring properties though I am not certain if this was always the case. I think that the projecting frontage was a later addition to utilise the space up to the edge of the building line. When it was built there may have been a small front garden similar to the other properties. The brickwork shows that there had been a lot of hotch-potch 'improvements' to the properties. You can see from the Victorian map extract that there used to be an entry between the two separate properties but this had been incorporated into the beer house with an entrance door. This may have been the outdoor. Another door was inserted in what looks like a former gateway and this was the entrance to the smoke room of the Vine Inn. The Vine Inn was located between Spring Cottage and Rose Place, the latter being occupied by the gold beater Thomas Elkington who employed three people at his premises in the early 1860s. Spring Cottage was home to the engineer Henry Jones and his family. Charles Vale was operating a beer house between these two households by 1868. Born in Birmingham in 1832, he had married Sarah Ann Hubbard in October 1858 at the Church of St. Peter and St. Paul in Aston. He had formerly worked as a glass cutter when the couple lived in Icknield Street in the early 1860s. Charles Vale advertised a Whitechapel Trap in the Birmingham Daily Gazette in February 1868. He stated that it was nearly new and suited a pony 12 hands high. The sale was to include a set of plated silver harness, a hackney saddle and bridle. The advertisement names him at the Vine Inn in Villa Street so we know therefore that the beer house was operating under this name during the 1860s. By the time of the 1871 census Charles and Sarah Ann were living on the premises with four children. The couple employed Sarah Matthewman as a general servant. In the early 1870s Charles and Sarah Ann Vale moved down the road to the Crown Inn on the corner of Nursery Terrace. This would have been viewed as an elevation in status within the licensed trade as the Crown Inn was a larger business and fully licensed. 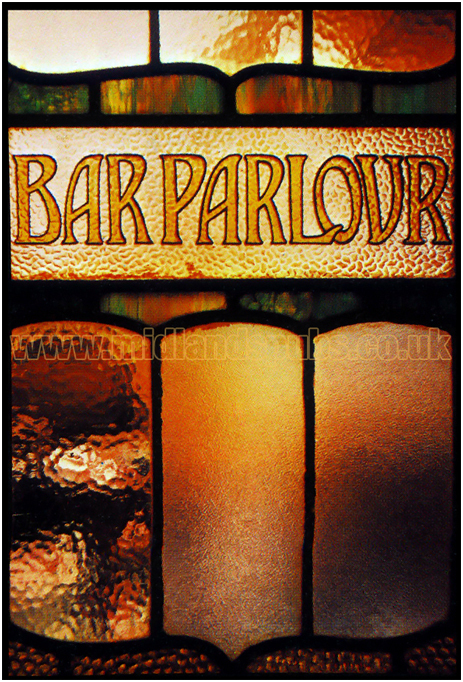 The Handsworth-born publican eventually returned to the glass trade but was still residing in Villa Street in the 20th century where he was documented as a glass manufacturer. The Vine Inn once had a parrot to entertain patrons. However, either the publican or the customers got fed up with the bird and, being described as 'a very good talker,' was advertised for sale in December 1872. 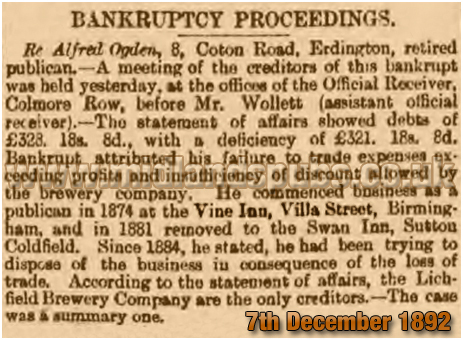 This newspaper article from 1892 shows that Alfred Ogden took over the Vine Inn during 1874. He had previously worked as a barman before taking on his own business. What this article does not show is that he moved to the Ingleby Arms in Ingleby Street, the licence being transferred in December 1874. His stay at Villa Street was therefore brief. In a subsequent hearing it was revealed that he had not kept proper books of accounts. However, his only creditor was the Lichfield Brewery Company and, following an appeal by his solicitor that the brewery had treated him harshly, the judge suspended his discharge for two years. In the early 1880s Harriet Harris was running the Vine Inn. She was documented as a retail brewer which suggests that the Vine Inn was a homebrew house. The widow lived on the premises with her son Frances, who worked in the jewellery trade, and her dressmaker daughter Helen. Her sister Ann was also in residence and may have helped to run the beer house. The small fire alarm across the road from the Vine Inn may have been in consequence of several blazes in the vicinity. One in particular broke out at Messrs. F. Green and Co., a firm based at the Phoenix Mills in Villa Street. Two of the firm's buildings were destroyed as a result of the fire. In the aftermath, the Birmingham Watch Committee were critical of the Aston Fire Brigade because their engine had arrived at the scene some twenty minutes earlier. It was considered that some parts of Aston such as Villa Street were too far from any emergency services and were reliant on help from Birmingham. The move to improve the fire brigade's response times was seen as a key factor in the Aston Local Board remaining independent of their neighbours. Alfred and Ellen Blunn were mine hosts of the Vine Inn at the time of the census of 1891. Alfred spent much of his younger years in Ladywood. He was working as a cellarman in Bull Street when he married the widow Ellen Hope at St. Peter's Church in January 1885. Hailing from Kidderminster but living in nearby Brookfields, Ellen's father was the builder John Doddwell. The couple had a son called Ernest. Living next door to the Vine Inn during the early 1890s were James and Kate Burrell. He was working as a currier which may explain why the property, later forming the smoke room of the Vine Inn, had a large entry passageway. If his leather processing business was conducted here then the smell of freshly tanned animal hides would have pervaded throughout the neighbouring cottages. Following his specialist treatment to the hide, he would supply local shoe and boot makers, along with saddle shops and glove manufacturers. James Burrell had new neighbours by the mid-1890s because Mrs. Mary Ann Maxwell took over as licensee of the Vine Inn. Her stay was, however, fairly short and soon after Arthur Devereux was in charge of the beer house. Born in Birmingham in 1856, he had previously kept the Japanners' Arms at Oxford Street in Bilston. Indeed, this was the hometown of his wife Maria Udall. The couple had tied the knot at Bilston in March 1881. They kept the Japanners' Arms between 1890 to 1893. They lived at the Vine Inn with their five daughters and one son. The eldest daughter, Jessie, was born in Glasgow in 1883 which suggests that Edward and Maria had briefly lived north of the border not long after their marriage. The Devereux's were probably working for a brewery rather than operating independently. 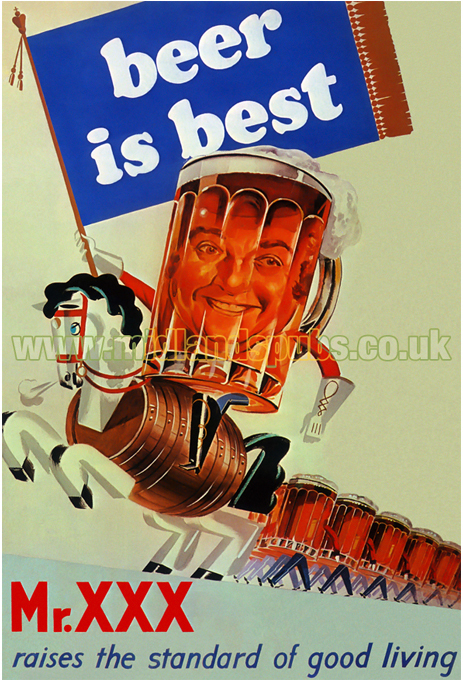 Certainly, we know that the Vine Inn would become part of the estate of Ansell's Brewery Limited. In any case, the couple were not making a fortune out of running this beer house. Arthur Devereux died in 1903 and his estate amounted to just £25. Maria Devereux remained in charge of the Vine Inn. Daughters Maria and Alice helped with duties around the beer house whilst three others brought in household income working for local firms. Minnie and Nellie worked in the jewellery trade whilst Marion took up a job as a chocolate packer. Maria's son Harry remained at school. Frederick and Barbara Mason were running the Vine Inn for Ansell's during the 1930s. They were living here during the Second World War. The above notice appeared in the local press during 1943. 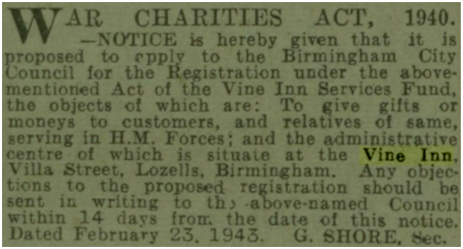 Many pubs in Birmingham and, indeed, around the country made such an application in order to raise money for the armed services or families of those serving in the war. The Vine Inn survived until 1978 when, despite a campaign to save the boozer, Villa Street was the focus of a new housing development scheme for young couples seeking starter homes in Birmingham. The Vine Inn was subsequently demolished to clear land for housing. This map shows the location of the Vine Inn during the early 1950s. Although the pub was listed at No.127, the boozer had been extended into the adjacent property which would have been No.125. The pair of properties can be seen in the map extract below dating from 1889. Here the two separate buildings can be seen - the map extracts show that the outbuildings of the Vine Inn were rebuilt at some stage, possibly new toilet facilities being installed by the brewery. In the Victorian map extract the Fire Brigade Alarm Office can be seen on the opposite side of Villa Street. This was later sub-divided to form Nos. 124 and 124a Villa Street. If you have a genealogy story or query regarding the Vine Inn you can contact me and I will post it here in addition to including your message within the website pages for Birmingham Genealogy. "I used to live at 118 Villa Street between 1958 to 1971. What happy memories I have of the street. Next door lived the Brady family, and on the other side was the Miller family. Carol Miller was a mate of mine. Further up the road was the Beech family. Mr. beech was the local chimney sweep. Other neighbours I recall are Moorehouse, Stone, Milligan, Joan Doyle and Linda Wilcox. Her mom and dad ran the shop four doors down. Then, of course, there was the Vine pub. My dad taught me to play darts there. He used to play for the Sports Argus and was the local window cleaner. I spent many a happy hour in the gardens of this pub. I would love to hear from anyone I have mentioned or anyone who remembers me and my family." "William Weaver, Fox Street, Birmingham, was charged with stealing 10 shillings from the till in the Vine public house, Villa Street, on the 18th March. He was detected in the act of robbing the till by the landlady, and he thereupon ran away. He was, however, overtaken, and given into custody. A term of six weeks' imprisonment, with hard labour, was imposed." "The last special licensing sessions to held at Aston took place this morning, Mr. E. S. Moore presiding over a full bench of justices. Mr. J. Ansell, on behalf of Ansell's Brewery Limited, made an application for sanction to structural alterations at the Vine Inn, Villa Street, Lozells. In making the application, Mr. Ansell explained that the proposed alteration comprised a rearrangement of the present premisesand the taking in of an adjacent cottage. Mr. Charles H. Collett produced plans showing that the drinking area would be increased from 290 to 538 square feet, and explained how the living and sanitary accommodation at the house would be improved by the alterations. After a short retirement, the Chairman announced that the justices were well acquainted with the present construction of the house, and the application would be granted. Mr. Ansell, referring to the fact that in view the Greater Birmingham scheme this would be the last licensing business to be transacted in Aston, said he felt particularly interested because the first application in relation to licensing matters that he ever made was to the Aston licensing authorities in the middle of the 1860s. Licensing matters for Aston were then dealt with in a small chapel in Bell Lane, Erdingion, which was occasionally used for magisterial purposes. Of the gentlemen who then comprised the Licensing Bench, Mr. Thomas Ryland, Mr. Thomas Colmore [the father of the ex-Stipendiary for Birmingham], the Rev. W. Kirkpatrick Bedford [vicar of Sutton Coldfield], and Mr. Joseph Smallwood [whose funeral he attended yesterday] had now all joined the great majority. He [Mr. Ansell] was successful in that, his first application, and he was glad to find that he was now successful in the last he should make to the Aston Licensing Bench." "Regulars won a temporary reprieve yesterday in their three-month fight to save one of Birmingham's oldest public houses from demolition. Locals who go to The Vine Inn in Villa Street, Lozells, put together a 202 signature petition against the demolition of the pub, which is on a site earmarked for the development of 44 houses. Because of the petition members of Birmingham's Planning Committee yesterday decided to defer a planning application for development of the site until they had visited the Vine Inn. Councillor Bryn Evans [Labour, Soho] who has led the protest by customers against the demolition, said: "This is one of the oldest pubs in Birmingham. It will not be replaced. It is one of the focal points in the area." Councillor Edward Franklin [Conservative, Sandwell] said: "The idea of this development was to try and keep young couples in Birmingham. They are starter homes to standard designs and sell as quickly as they are put up." "Drinking Time Is Not Quite Up"